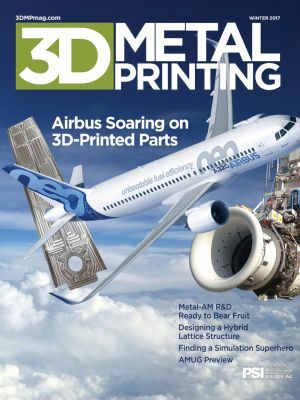 Initially inspired and driven by the needs of the aerospace industry, the NextManufacturing Center at Carnegie Mellon University focuses on several specific challenges of 3D metal printing, including process mapping, monitoring and control, and predicting and controlling porosity. The part included both solid and lattice regions, and state-of-the-art software made its design buildable. Follow these guidelines for designing support structures and for specifying part layout and orientation on the build plate, when exploring the design and manufacturability guidelines required to tackle build geometries. As 3D printing permeates the manufacturing landscape, it holds great promise. But that promise only will be realized with a thorough dedication to, and understanding of, the simulation process. The Additive Manufacturing Users Group’s annual affair features stellar keynotes, tracks geared to markets, processes and education, and training galore, not to mention networking opportunities. With 3D metal printing leading the way, service bureau Forecast 3D employs processes galore to bring new products to life. In designs and materials, bicycles have evolved, thanks to the evolution of manufacturing processes such as 3D printing. New Metal Printer, for Stainless Steels, Deemed "Affordable"